"Just imagine how forgetful I'll be when I'm eighty!" Today would have been Anne Frank's 80th birthday, had she survived WWII. After living in hiding in the top floors of a warehouse in Amsterdam with her family and four other Jews for over two years (July 6th, 1942, to August 4th, 1944), they were betrayed by an unknown character. 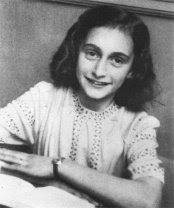 Anne died in March of 1945 from Typhus in the Bergen-Belsen concentration camp in Nazi Germany, a few weeks before the camp was liberated by British troops. Anne kept a diary throughout their time in hiding, and her father (the only one to survive the war and concentration camps) later published it. It has since been translated into many languages, and is considered to be one of the most important written works of the 20th Century. I've been reading it the past few days, unaware of the significance of today's date in relation to Anne Frank. It's a very fascinating read, but somewhat of a downer. You find yourself hoping that they all make it through at the end, but the while, you know how it ends. Still, it is very interesting to see the view of World War II from Jews in hiding, and the day-to-day life in the "Secret Annex" where the Franks, Van Pels and Fritz Pfeffer lived. "Never Again!" was the cry after World War II. And yet, today we can see the rise of another Hitler wannabe: Iranian President Mahmoud Ahmadinejad. The last major leader to publicly declare his intent to wipe the Jewish people off the face of the earth was not taken seriously until it was too late, and millions of innocent people were murdered. The world leaders do not take this man seriously, either (see previous posts on the subject). If Ahmadinejad gets a nuclear weapon, he will use it. This past week, an elderly man shot and killed a guard (by the name of Stephen Johns) at the U.S. Holocaust Museum in Washington, D.C. The man, who does not deserve to have his name mentioned, was a rabid anti-Semite, anti-government radical, and ran a website dedicated to various neo-Nazi, anti-Semitic conspiracies and views. He was shot by one of the other guards at the museum, and is currently in critical condition. Like Mahmoud Ahmadinejad, this Hitler lover is also a Holocaust denier (his views on the human race coincide with many of the Nazi elite and Darwinist views as well). Many on the left and in the media constantly refer to this man as 'right-wing'; I disagree. There is a point that one can reach which is neither left-wing or right-wing, but enters the realm of crazy-land. However, no one of the left or the media sees it that way. To alter one of Anne Frank's quotes, "What one liberal does is his own responsibility, but what one conservative does is thrown back at all conservatives." Anne Frank, her family, and millions of Jews suffered and died at the hands of maniacal psychopaths. May we not be the generation to allow it to happen again.